In Android Application to Perform multiple task you have to create different activities or services or both but using fragments you can use multiple views in single fragment activity. 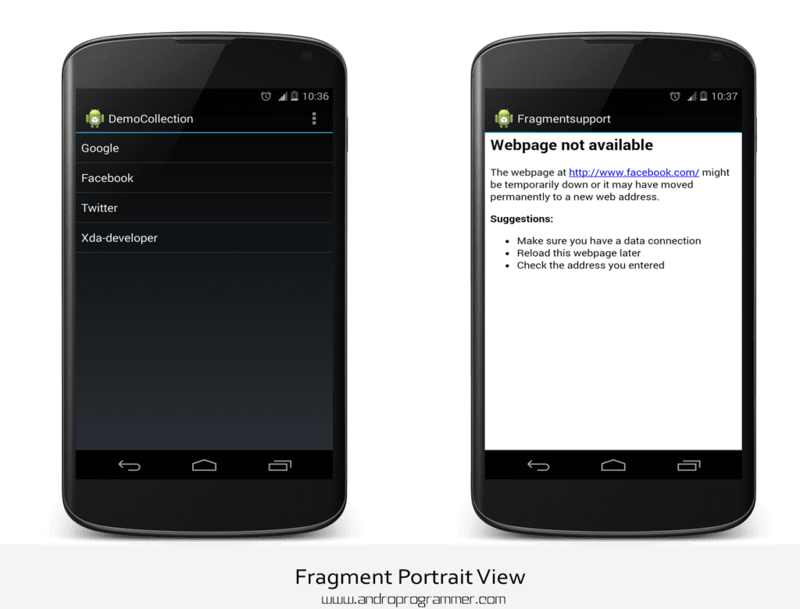 The Concept of Fragments comes from Android 3.0 (Honeycomb) but now developers have created many API so you can use it in below android version also. In this tutorial i am going to explain you how you can implements fragment in your application easily. The Fragment concept is quit confusing and from documentation you can not understand it properly. So Go through the full tutorial and don't miss any steps because it is confusing so you may miss some of the main points. In this tutorial i am going to create List of Website and When user clicks on it. it will open that site in web view. so these are the files i am going to create in my project. i am clarifying it because their are many tutorials but in many of them you get confuse between those files so have a look it. This is how it looks in portrait view. When mobile is in Portrait view only one view is display to the user. when user click on list item then new view is get created and display to the user. you can add view in back stack of fragment. further read about back stack navigation. 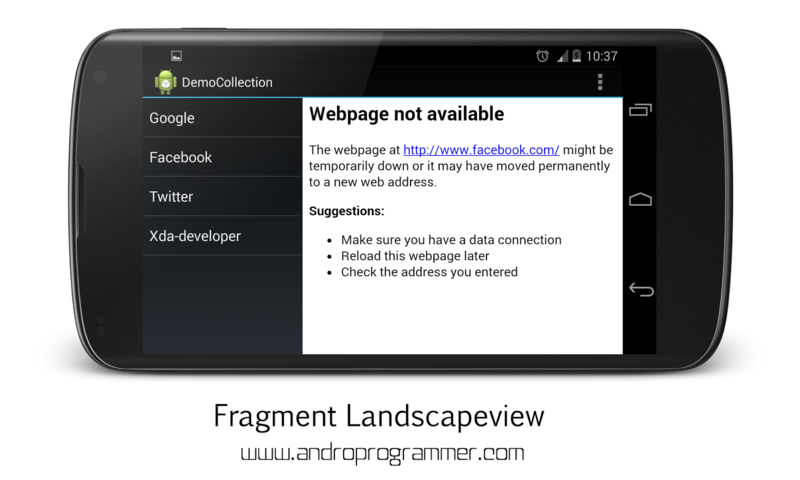 Below image is of fragment in landscape view. in order to work your application in landscape mode you have to create folder name as layout-land. Step -1 :Create New Android application and give name MainActivity to main activity and same name for layout file. minSdkVersion="11” and targetSdkVersion="17".you can use below android version also for compilation and build option. Step-2 : in your activity_main.xml file add fragment in it. when you add it in eclipse you have option to create fragment class but in android studio you will see below popup box then select any of them we will change it later. Now below coding is of activity_main.xml file you can put it in your code. That's it. you have created fragment project successfully. so now customize it as you require. you can download full source code from here. It was due to case sensitive xml code so i have changed it. Share your code or any exact problem you are facing so I can help.